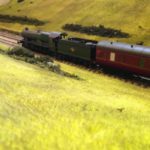 If you read my last post and were intrigued by the reference to EM gauge or have been thinking about moving from OO to EM gauge this is for you.As mentioned in a previous post on my new layout, Windon, is a mixed EM / 009 gauge model railway. 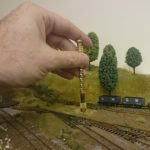 Many experienced modellers reading this blog will be familiar with these gauges but I know from your emails there are also a large number of readers who are just starting out in the hobby and aren’t familiar with this alternative track format so here’s a quick introduction to EM Gauge and why I’ve chosen it. Note: to keep this article brief I’ll cover 009 in a future post. Watch this space. If you ever look at your model trains and think they seem a bit toy like there’s a good reason. 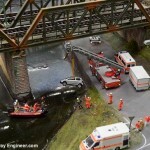 The track of OO gauge railways isn’t the same scale as the models and trains that run on it. OO Gauge trains are built to a scale of 4mm to the foot so the track should be 18.83mm wide. In reality, it’s just 16.5mm wide and is too narrow. Why this is the case can be found in the history of OO gauge railways covered at length here. 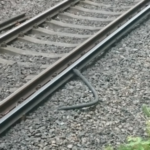 The result is that the OO track and trains don’t look quite right together compared to the real thing. In the 1950s modellers set about correcting this and devised track and wheel sets for 4mm scale trains. 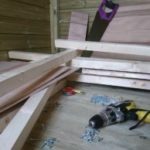 After a while several standards emerged, specifically EM gauge and P4. P4 is the most accurate of the two, with a track gauge of 18.83mm but it can be difficult to fit the wheel assemblies into existing OO trains. By contrast, EM gauge is a great compromise of almost correctly proportioned track (18.2mm) to the 4mm models and wheel sets that can be fitted many ready to run OO gauge models (especially modern era locos such as those seen on the Brighton East EM gauge pictured above) without substantial reworking. In fact, for a lot of modern-era rolling stock all that’s required is popping the existing wheels and swapping them with EM gauge equivalents although in some cases it’s necessary to scrape some of the plastic off. (Steam-era locomotives requires more substantial reworking). If you’re wondering how 18.2mm wide wheel sets can fit into rolling stock designed for 16,5mm the answer is that EM gauge wheels are narrower than the OO gauge versions so the total width required it pretty much the same. 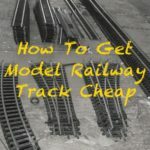 The result is track that looks more realistically proportioned to the models while also being compatible with a lot of OO gauge Hornby, Lima and Bachmann locomotives and rolling stock. 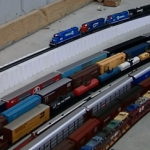 As mentioned in my first post of my new layout there are several reasons behind my choice of EM gauge over other popular gauges. 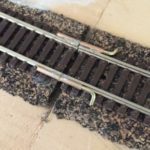 Over OO gauge: No question, EM gauge track just looks so much better! Over P4: The choice between P4 and EM gauge comes down to time and effort. Retro fitting P4 wheels and axles into the Network Southeastern rolling stock I have and will be getting will be a lot more work than with EM and frankly I’d rather spend my time on better things than fitting wheels. 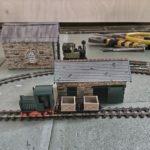 Over N Gauge: I seriously considered this option not just because a lot more track could be fitted into the area I have to work with but also because I have a lot of N equipment and it would save me a fortune in new track and trains. However, I enjoy intricate model making and while I do it on N gauge this work is simply more visible on larger scales. In summary, EM gauge looks better, gives me more options and will be faster and easier to get working. If you’re interested in EM gauge I recommend joining the EM gauge society.